Austin, the capital of Texas since 1839, is the fasted growing city in the United States. 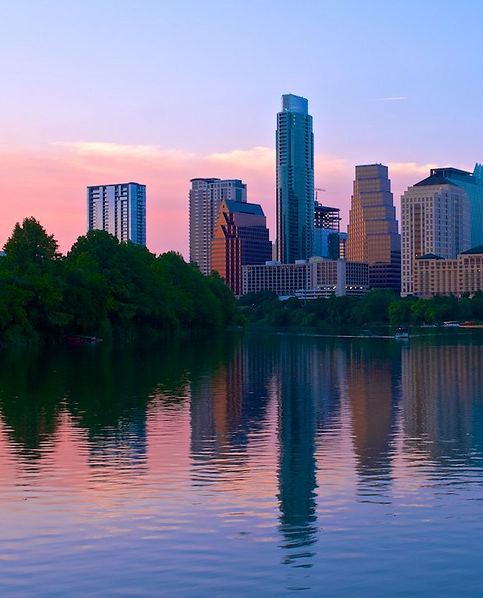 An urban zone immersed in natural beauty, Austin sits amidst lush rolling hills, and numerous lakes and rivers. The culture is thriving with a diverse range of music, performing arts, film, technology, fine foods, and athleticism. Despite widespread stereotypes of Texas, Austin is in the heart of the hill country, with rich landscapes of forests and waterways. Downtown Austin is perched alongside Lady Bird Lake, a reservoir on the Colorado River that runs through Central Texas. There is a 15 mile hike and bike trail that traces the lengths of the reservoir and some adjacent roads and parks, inspiring an athletically abundant culture of jogging, biking, and dog walking throughout each day. With delightful weather most of the year, you will not often see Lady Bird lake empty of kayakers, paddle boarders, and the local rowing club. You can even catch local bands playing a concert atop the water from rafts, canoes, or tubes for the Midsummer Serenade Series. You will find natural monuments such as the renowned Barton Springs Pool, an enclosed bit of natural spring that attracts thousands each week. The 3-acre lake is spring fed, and the water averages 68 degrees Fahrenheit year round. There is an 8 mile stretch of protected land along Barton Creek with hiking trails, waterfalls, swimming holes, rock climbing routes, and pristine wilderness that begins in Zilker Park near downtown, heading into Westlake Hills. Austin is home to a large population of musicians, some known around the world. With an international reputation for being the “Live Music Capital of the World,” there wont be a day or night in Austin without a vast number concerts in an array of genres. Most restaurants and nearly all the bars in Austin have the capacity to be a live music venue at some capacity. There are now a good number of Fortune 500 companies headquartered in Austin, and since the influx of technology and developmental companies in the 1990s, this high-tech town has been recently nicknamed the “Silicon Hills.” Conventions and festivals such as South by Southwest bring millions of techies to Austin for events and seminars each year. There is a rapidly growing foodie culture in Austin that has made it a hotspot for innovative and delectable selections of cuisine. Chefs from every corner of the world have created their dream kitchens that attract appetites from far and wide. A long standing local motto, “Keep Austin Weird,” refers to the movement and desire to protect small, unique, and local businesses from being overrun by large corporations. The eclectic aesthetic of Austin manifests in its restaurants, cafes, and hotels. From the classically eccentric old-Austin flavor, to the newer sleek and modern tastes, you wont find a corner of Austin that doesn’t catch your eye. Check out some of our favorite selections of places to stay, and spots to eat! Check out some more amazing Austin Recommendations from our friends at So Much Life! And keep following us for more Wanderlust Destinations like Chiang Mai, Thailand!